There are 351 districts, 1,411 public schools, and 7 charter schools in Iowa serving 495,870 students. 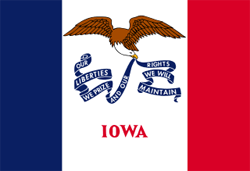 Financially the state of Iowa spends approximately $11,913 per student. There are 34,658 full-time teachers receiving a total of $2,111,774,256 in salaries and $670,349,557 in total benefits. 158,315 students receive a free lunch and 35,831 receive a reduced-price lunch.